This graph shows the average age of cars on the road in the United Kingdom (UK) between 2000 and 2016, including projections for 2015 and 2016. 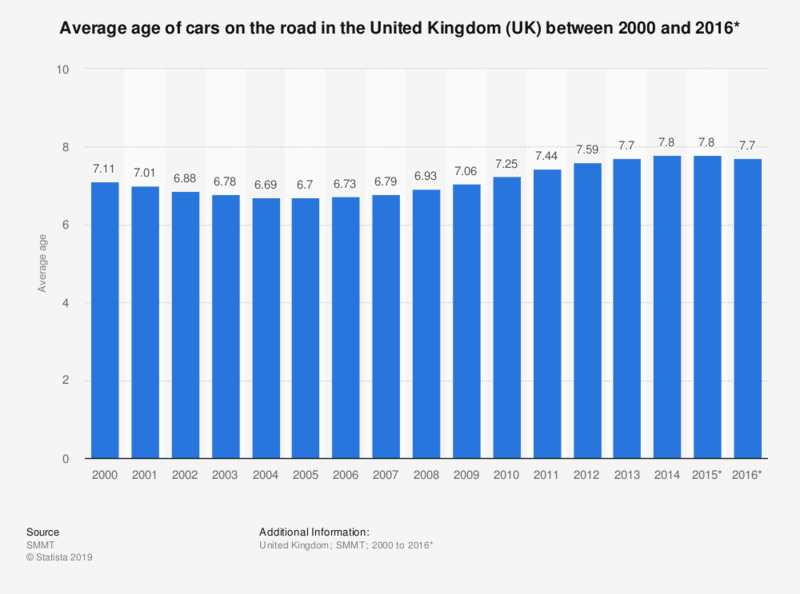 It can be seen that before the recession the average age of cars in the UK was falling, however, since the recession the average age has risen drastically and will probably continue to rise. These figures show that people were preferring to hold onto their cars for longer rather than sell them to buy new cars. Comparing the projected average age of cars on the road in the UK in 2015 with the average age of light commercial vehicles and the average age of buses in use in Great Britain in 2015, shows that the average age of these vehicles is slightly higher than the age of cars on the road. On the other hand, the average age of auctioned cars in the UK in 2015 was slightly lower than the average age of cars on the road in 2015.